*An Idaho state legislator is facing backlash after sharing a conspiracy theory that former President Obama helped to stage-manage the violent white supremacist rally in Charlottesville, Va., as part of a master plan to destroy President Trump. 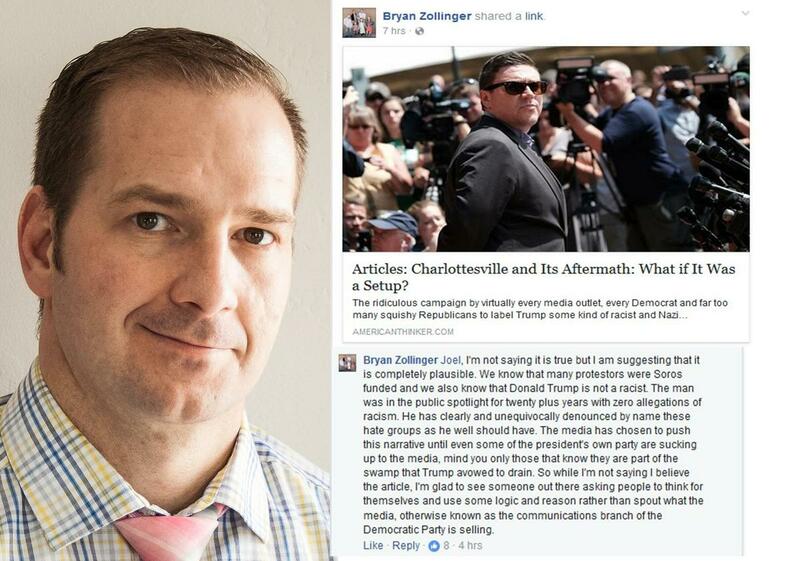 Idaho Rep. Bryan Zollinger on Friday posted a story on Facebook that suggested Obama and other top Democrats like billionaire George Soros and Virginia Gov. Terry McAuliffe were part of a conspiracy to set up the rally, according to the Post Register reported. “I’m not saying it is true, but I am suggesting that it is completely plausible,” Zollinger wrote on Facebook. The story claims that Obama has a secret “war room” to fight against the Trump administration – a claim that has largely been debunked – and that the “Unite the Right” rally in Charlottesville, organized by white supremacist Jason Kessler, was actually part of Obama’s plan. The Charlottesville rally turned violent when white supremacist groups, including neo-Nazis and Ku Klux Klan members, clashed with counterprotesters. A woman was killed when a car driven by a white supremacist plowed into counterprotesters. Both Democrats and Republicans criticized Trump’s initial response to the rally, when he blamed “many sides” for the violence. Days later, he criticized white supremacists, but then later reverted to his initial stance, blaming “both sides” and specifically accusing the “alt-left” of provoking violence. A good use of a Political “War-Machine” would be to Target this Legislator’s electorate, find the crack in his armor and go to work removing him from office. When you get responses like his, it actually reveals to the world his own thinking and deviousness. It is more likely that he and his kind would actually “Orchestrate” things such as this without regard to human safety.